Golf breaks in The Loire, France, French Golf holidays & Golf weekends in France. The Loire Valley epitomizes the austerity and grandeur of old-fashioned France, with glorious verdant countryside, peppered with magnificent chateaux along the banks of the meandering river. The Loire is rated 5.0 out of 5 based on 1 verified reviews from YGT customers. They played and stayed (we even checked they signed their scorecards). Gastronomy and wine are buzz words in the Loire, but the golfing possibilities should certainly not be underestimated. The Western Loire is blessed with a fantastic coastline, along which are dotted some of France’s most popular resort towns; head to La Rochelle or particularly La Baule, whose terrific courses and hotels add a welcome edge to a beach holiday. 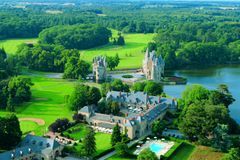 Further inland you may find fewer tourists, but you will find famous chateaux, particularly at Blois, Chambord and Villandry,a s well as the outstanding resort at Les Bordes, whose golf course has been ranked as the best in continental Europe. The rich soil of The Loire have seen it dubbed ‘The Garden of France’, and the fertile ground has also spawned some of the country’s finest golf – why not choose this tremendous region for your next French golf holiday?